Ever since Jericho was seven years old, he dreamed of one day owning his own bike shop. After his father purchased a Redline bicycle for him, he discovered a newfound freedom and fell in love with riding his bike everywhere. Eventually he embraced the world of BMX after participating in an after-school bike program run by a professional BMX rider. He poured all of his money into collecting BMX bikes and racing in Eugene, OR. Then, the racing stopped. 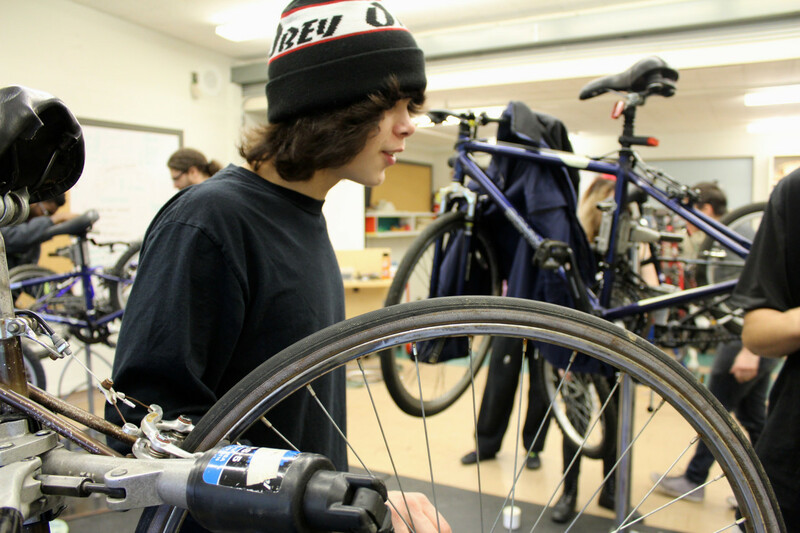 When he started attending Helensview School in Northeast Portland and realized it had a bike shop on its campus, Jericho was beyond excited to have bicycling back in his life again. In January, the Community Cycling Center partnered with Helensview School to launch a new 10-week bike class. 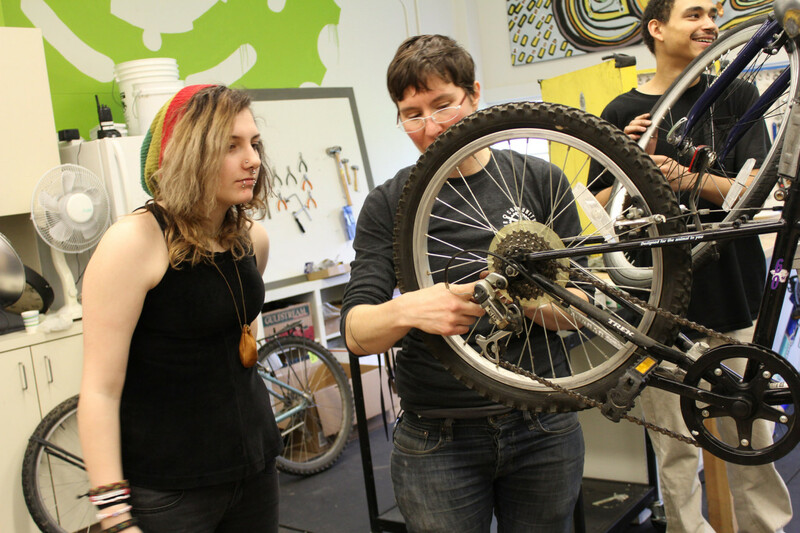 This is not your typical bike maintenance class. We worked with Helensview’s science teacher, Dammes, to design new curriculum that teaches students science while working on bikes. “The class is based on project-based physics and concept-based physics” said Dammes. 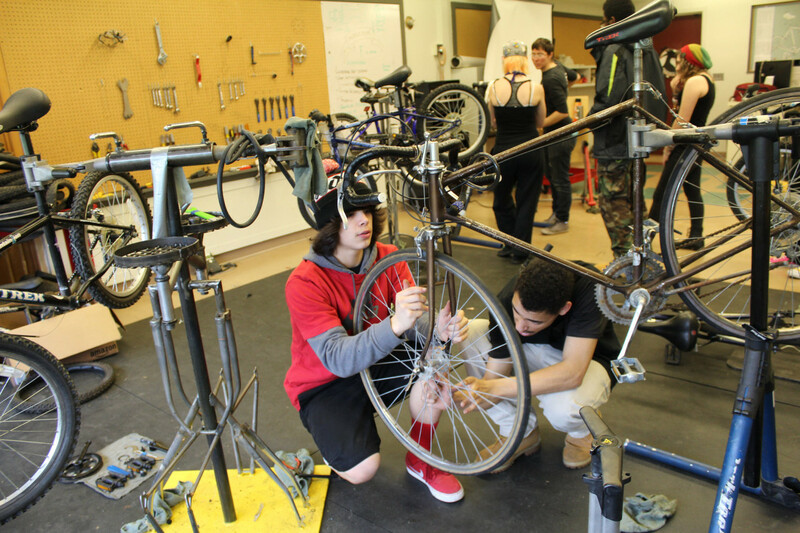 The students then apply those concepts to the mechanical world of bikes, allowing them to experience hands-on science lessons in a bike shop environment. Many students were quick to share how this class is different from the traditional learning environment that they are used to. Dammes explained that one of the biggest challenges at Helensview School is student attendance. Helensview is an alternative school where students are referred by the school district. Some students experience homelessness, addiction, mental health challenges, and other barriers that prevent them from attending school. Helensview offers culturally relevant curriculum, smaller class sizes, support services, and a credit recovery program, empowering students and allowing many to successfully graduate and transition to the next phase of their lives. We are pleased that this partnership will offer a stepping stone for many students, whether it’s offering a way to earn enough credits to graduate, inspiring students to learn more about physics, or even providing the foundation and training they need for a career in the cycling industry. This program is funded by the Central Northeast Neighbors (CNN) Small Grants Program.